Spoiler warning! If you're trying to avoid finding out about anything that happens in Allegiant before the release date on 22nd of October, you may want to look away now. <-- Click the image to read the review! 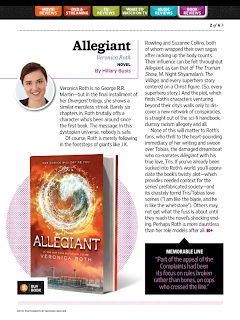 Entertainment Weekly has published the first review of the third and final book in the Divergent trilogy by author Veronica Roth! Click the image to see what they have to say! There are some pretty shocking revelations about what to expect! And we cant wait! Pick up your copy of Entertainment Weekly on newsstands tomorrow.